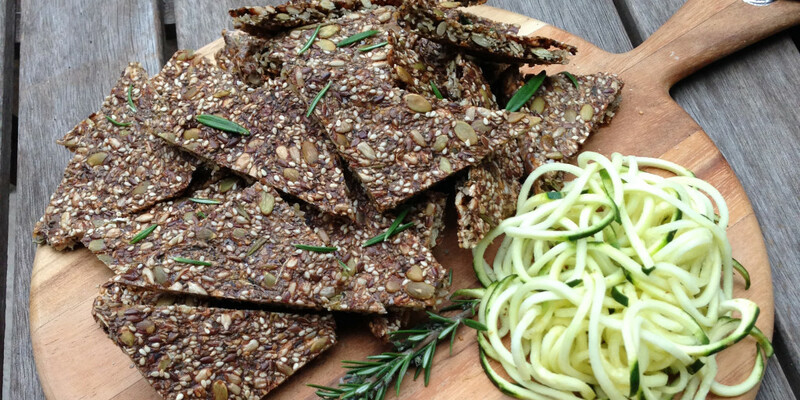 This gluten-free cracker recipe comes from Sami Bloom. We recommend serving these crackers with some avocado, cream cheese or hummus, yum! 2 sprigs of fresh rosemary, leaves removed. 1. Grate the zucchini and place it in a strainer with a pinch of salt to drain the water from it, for about 10 minutes. 2. Meanwhile, combine the rest of the ingredients, allowing them to sit in the water for 10 minutes to absorb. 3. Gently press out the excess water from the zucchini and combine with the seed mixture. 4. Preheat the oven to 160 C and line a large baking tray with baking paper. You might need two baking trays. 5. Scoop mixture out onto the tray and spread thinly, this will ensure they are crisp. Bake for 1 hour or until crisp. Allow to cool before breaking it up or slicing it into cracker-sized triangles/squares. If you love this recipe, check out our Meal-In-A-Biscuit Cracker.